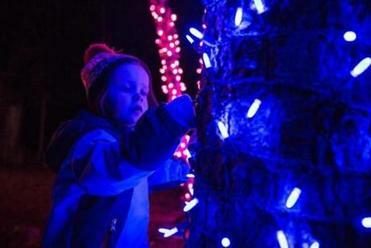 Charlie Wier checks out a lighting display at the annual ZooLights event at Stone Zoo. For Australian transplant John Edwards, nothing about the winter holidays in New England is quite so magical as the dark evenings after Thanksgiving when the earliest holiday decorations begin to appear on lawns and porches. Indeed, Edwards has picked up on something specific to American culture: We love our holiday lights. And while some suburbanites make their way to Boston Common every year to see the lighted trees, there are numerous locales in the suburbs where displays can be admired, as well. One of the oldest is Edaville Family Theme Park, in Carver. Built amidst the cranberry bogs of Southeastern Massachusetts, Edaville is primarily known for its focus on trains and vintage amusement park rides. But every December, thousands of visitors flock to see the park’s Christmas Festival of Lights. 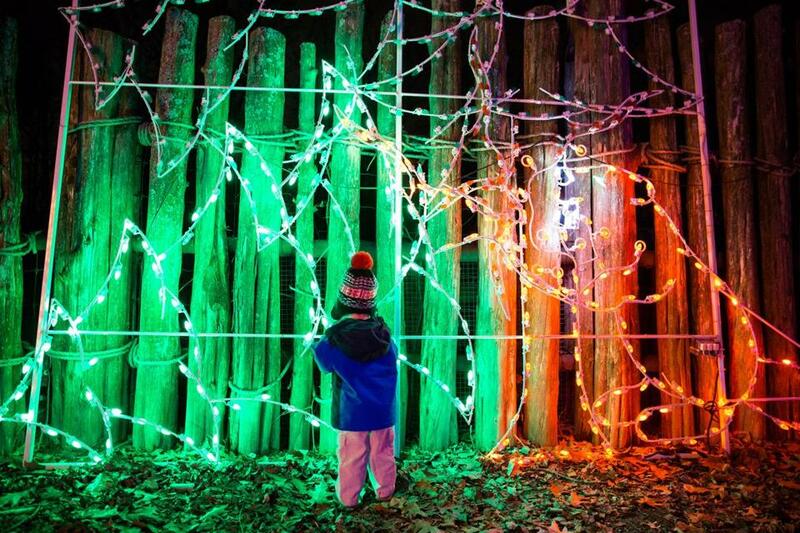 At Stone Zoo, in Stoneham, children can visit their favorite animals amid the winter wonderland of ZooLights. And in Boylston, Tower Hill Botanic Garden has illuminated its 15 acres of formal gardens for the 20th year. Drew Bennett, a social media strategist from Attleboro who blogs about family-friendly excursions and activities, looks forward to taking his two children to Edaville this year, having been impressed with what they saw there last year. Highlights of their last visit were the Dickens Village and the Old World Whittling Shop. Finding the sweet spot between nostalgia and innovation is always the challenge for this kind of beloved destination, said Edaville spokeswoman Katrina Raspa. Families have a lot of holiday entertainment to choose from, Raspa pointed out, from the Boston Pops at Symphony Hall to the Enchanted Village at Jordan’s Furniture in Avon. But while some are drawn to the glitz of Edaville’s rides and the Santa visits, others seek a more serene holiday experience, such as Winter Reimagined at Tower Hill, where acres of gardens, trees, and shrubs, along with illuminated paths, sculptures, and fountains, sparkle in the glow of the thousands of lights. Indoor features include a wishing tree forest, an up-cycled igloo, and two towering conservatories brimming with subtropical plants. 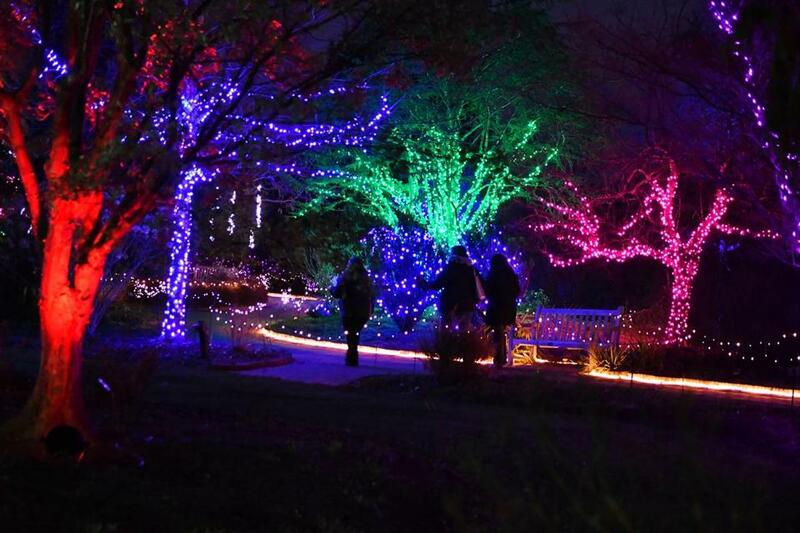 Visitors enjoy the the holiday lights display at Tower Hill Botanic Garden. Lisa Jensen-Fellows of Acton discovered Tower Hill during the warmer months, but one fall day four years ago she was strolling through its gardens when she noticed a landscaper stringing lights on the trees. Curious, she returned in December with her husband and three children, and the family hasn’t missed a year since. Jensen-Fellows’ family is looking forward this year to introducing their Tower Hill tradition to an aunt as well as a new friend visiting from Nepal. And while Santa may not have time for a trip to Massachusetts before Christmas, children can meet a real reindeer at Stone Zoo, one of several zoos nationwide that takes advantage of the holiday season for special exhibits combining its animal residents with holiday decor. 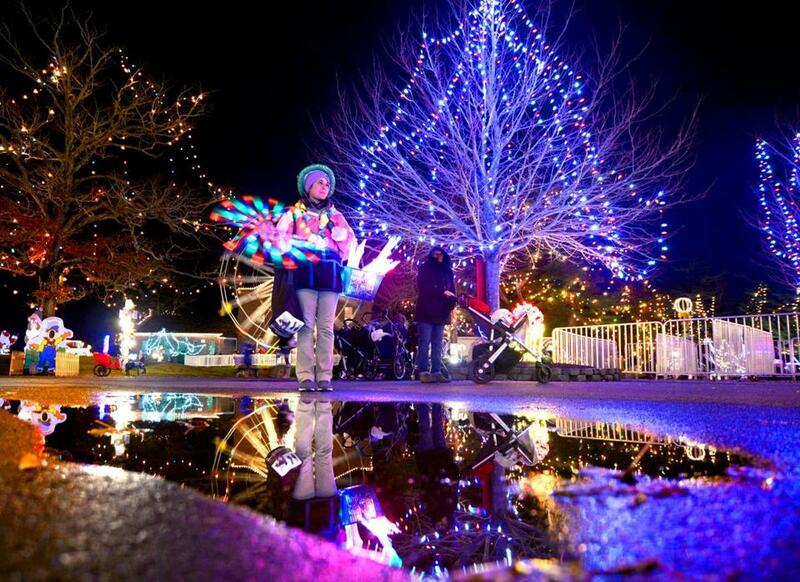 For Cady Audette of Carlisle, Zoolights proved the perfect way to keep all of her children — ages 1, 7, and 9 — engaged when the family visited it for the first time earlier this month. Tess Beckwith, 17, of Plympton sells light-up wands at Edaville Family Theme Park in Carver.